Cables run by Teams, which is partly owned by the Kenyan government, and Eassy – a consortium of telecoms companies – were damaged at the weekend. 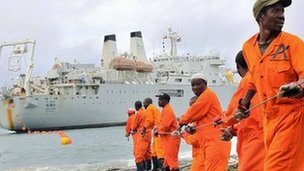 Internet service providers and mobile phone operators have re-routed to the Seacom link – which was not damaged by the dropped anchor. But the companies have only bought a small amount of bandwidth because of cost. The BBC’s Noel Mwakugu in Nairobi says as a result internet connections are expected to slow down by 20% in Kenya, Rwanda, Burundi, Tanzania, Ethiopia and South Sudan’s capital, Juba. Seacom – the first to be up and running – links East Africa to Europe, India and South Africa. Teams links the region to the United Arab Emirates – and Eassy, which went live in July 2010, links countries along the East African coast. Correspondents say that since then, the increased bandwidth has given a boost to mobile services and the burgeoning tech scene of home-grown developers, programmers and designers in Kenya. In the first 12 months after the cables arrived, the number of internet subscriptions in the country jumped from 1.8m to 3.1m. Previous articleHP Introduces 27-inch All-in-One Workstation: New World Record?